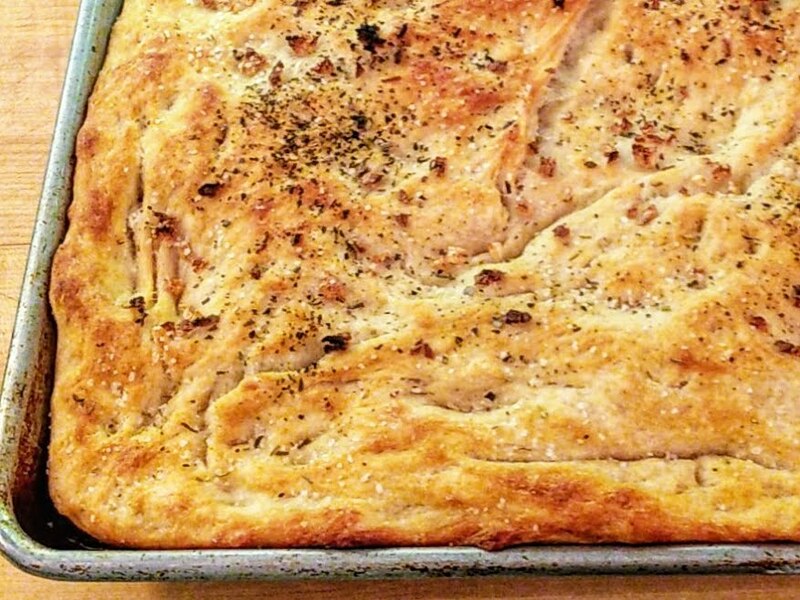 I really, really love to bake focaccia bread. 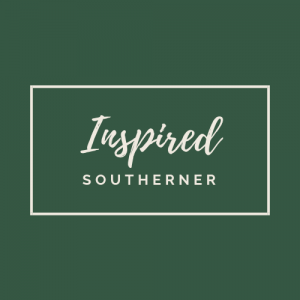 It’s one of those projects with lots of time in between so it’s perfect for a night of writing and cleaning and cooking and doing all those things this working mom does to bring the bacon home and fry it up in a pan for my little family. Please don’t be put off by the time it takes to prepare this Italian treat. Relax and realize that you’re going to stick this puppy in the fridge overnight, and wake up to a dreamy dough that’s ready to be baked off and eaten warm. One more thing: embrace the olive oil. This recipe calls for a lot of it, but that’s how you get the crispy crust on the bottom! Combine the flour and 2½ cups of room-temperature water in a large bowl. If you have a mixer with a dough hook, use it. It’s OK if you don’t. Incorporate the flour and the water with a wooden mixing spoon or your hands until it forms a dry dough. Stir the yeast, sugar, and ½ cup warm water with a fork in a small bowl and let it dissolve and then foam, about 5 minutes. 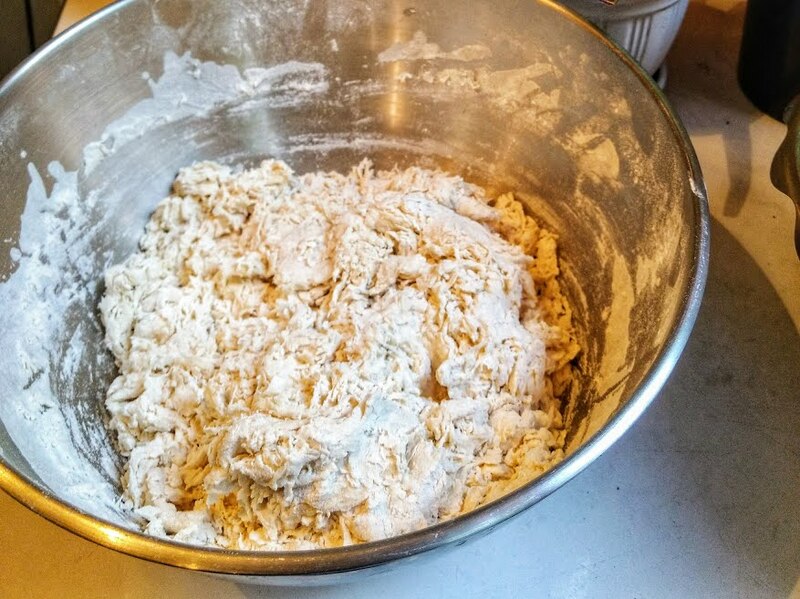 Pour the yeast mixture into stand mixer bowl and mix on low speed until dough absorbs all additional water or mix vigorously with your hands. If using your hands (like me) beat the heck out of it, but get all the water incorporated. Add the salt, and either crank your mixer speed up to medium or get ready to work out some frustrations for about five minutes. I will admit that this is not an easy task with your hands, but I enjoy the workout and beating things. Don’t judge me. It’s been a rough week, and it’s only Wednesday! Your dough should be sticky and elastic and you should feel whole again after kneading this dough with your own raw strength. Pour 3 Tbsp. oil into a large bowl, coating the sides. Scrape in dough into the bowl with a spatula or bench scraper. Cover the dough and place it in a warm spot until dough is doubled in volume, 2–3 hours. Rub about 2 Tbsp. of the olive oil all over the sheet pan. Deflate your dough by punching it a few times in the bowl (this works wonders for my stress levels). Transfer the dough onto your greased baking sheet and spread it out a bit. Don’t work it too much at this stage. Cover the dough with a piece of well-oiled plastic and let it rest for about 10 minutes. Uncover the dough and stretch it across length and width of baking sheet, but keep it even. Work the dough into the corners. If the dough bounces back, let sit 5–10 minutes and start again. Cover itt again with same piece of oiled plastic and chill at least 8 hours and up to 24. Pull the dough out of the fridge and let it sit in a warm spot until the dough is all puffed up and bubbly looking, about an hour. Preheat to 450°. Remove the plastic and drizzle oil over it. Oil your hands again and make dimples in the dough with your fingers. The deeper, the better. Spread the chopped garlic over the dough and push it into the dimples. Sprinkle it generously with salt and dried herbs. 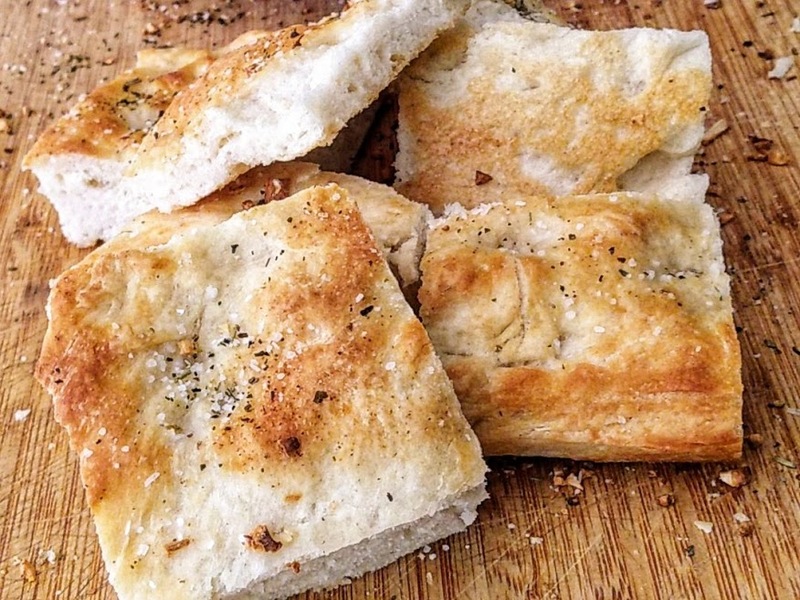 Bake the focaccia until it’s GBD (golden, brown, delicious) about, 25–35 minutes. Let it cool for about 10 minutes. Run a spatula underneath the bread to separate it from the pan. Knock it out of the pan by turning it upside down and slapping it (and relieving more stress). Let cool completely before cutting as desired. Freeze what you won’t eat in a week. Otherwise cover it tightly in plastic wrap and leave it out on the counter. Do not refrigerate it.